The 2016 Grammy Awards ceremony is underway. Kendrick Lamar has already won five, including the first televised award of the night, Best Rap Album. 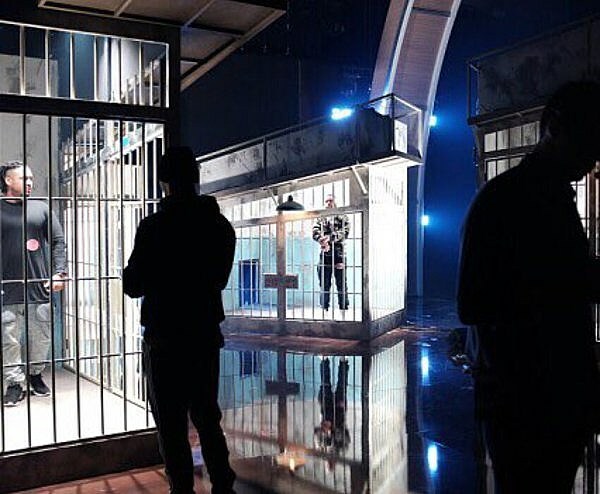 The Weeknd played “Can’t Feel My Face” and “In The Night.” Check out a video below. Chris Stapleton won Best Country Album for Traveller, his second win of the night. Ed Sheeran‘s “Thinking Out Loud” wins for Song of the Year, beating Kendrick Lamar, Taylor Swift and more. Rihanna was supposed to perform but cancelled her performance. Apple Music and Sonos aired a commercial featuring The National frontman Matt Berninger, St. Vincent and Killer Mike, plus music by Anderson .Paak. Watch it below. 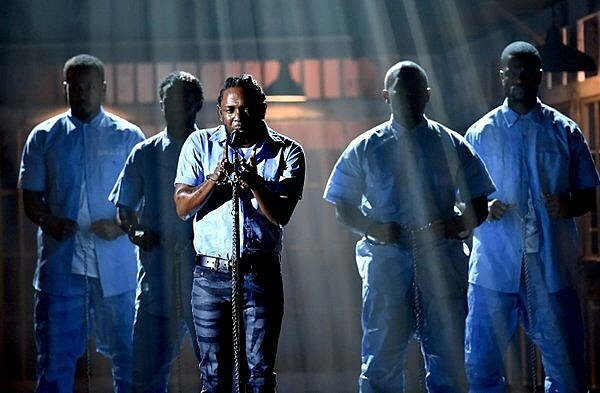 Kendrick Lamar‘s awe-inspiring performance began with him walking out leading a line of people in chains and prison uniforms, as others were locked inside jail cells. He started “The Blacker The Berry,” as one of the prisoners in the cell played saxophone. Then they broke the chains off and started dancing as the lights shut off and revealed neon costumes. As Kendrick transitioned into “Alright,” the scene changed to a bonfire with tribal drummers in facepaint. Then he ended it back at the mic and debuted a brand new (incredible) song. It ended with an outline of an African map that read “Compton.” Maybe just a bit better than an Imagine Dragons collaboration. Watch below. Hamilton won Best Musical Theater Album. Creator and star Lin-Manuel Miranda and the rest of the cast performed Hamilton‘s opening number live from New York’s Richard Rodgers Theatre — introduced by Stephen Colbert — and accepted live from the stage too. Watch a video of their performance below. Alabama Shakes win Best Rock Performance, making that three wins for them. Adele performed “All I Ask.” Watch below. Miguel covered Michael Jackson‘s “She’s Out Of My Life,” which you can watch below. Courtney Barnett lost Best New Artist to Meghan Trainor (not a surprise). 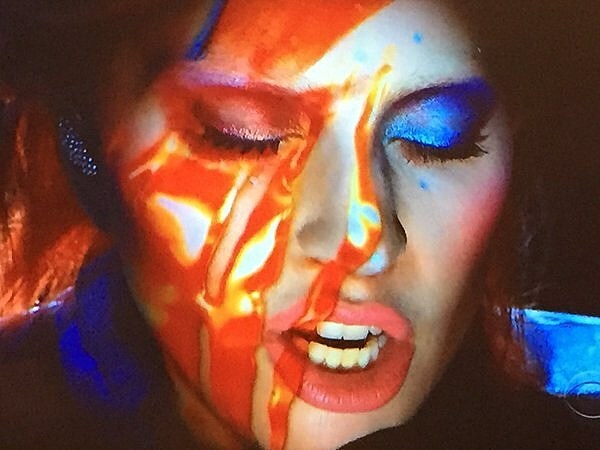 Lady Gaga, with an orchestra, backup vocalists, Nile Rodgers on guitar, Raphael Saadiq on bass, and more, began her David Bowie tribute with “Space Oddity” as the Aladdin Sane lightning bolt was projected over her face, then a projected spider crawled over it. She transitioned the medley into “Changes,” “Ziggy Stardust,” “Suffragette City,” “Rebel Rebel,” “Fashion”,” “Fame,” “Under Pressure,” and finally “Let’s Dance.” Then she took a quick pause and went into “Heroes,” ending with Bowie’s face projected on screen behind her. Watch a clip below. After the performance, a commercial for Intel aired featuring Gaga with her band’s instrumental cover of “Heroes” playing in the background. Chris Stapleton, Gary Clark Jr and Bonnie Raitt did a medley in honor of the late BB King. Watch below (via Perez Hilton). Alabama Shakes played “Don’t Wanna Fight.” Watch below. “Many of us play rock and roll but only a few of us are rock and roll. Lemmy was rock and roll,” Dave Grohl said to introduce the Motorhead tribute. He shouted out Motorhead drummer Philthy Animal, who passed away in November, too. 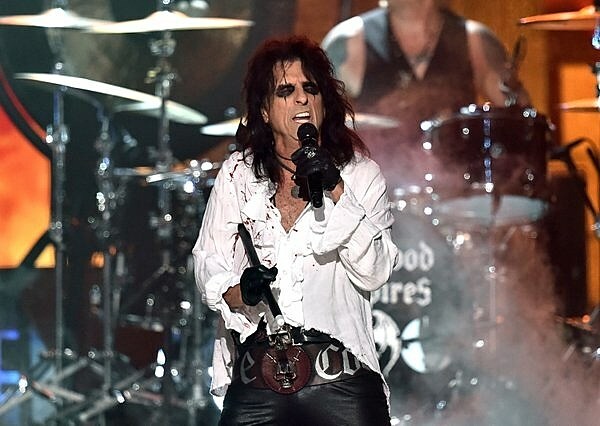 Then the Hollywood Vampires, a band including Alice Cooper, Duff McKagan (Guns N’ Roses), Joe Perry (Aerosmith) and Johnny Depp, played their song “As Bad As I Am” followed by a cover of Motorhead’s “Ace of Spades.” Watch below. Taylor Swift won Album of the Year, beating Kendrick Lamar and more (also not a surprise). Before the telecast, the pre-telecast revealed several other winners. Winners include Bob Dylan for Best Historical Album; Taylor Swift for Best Pop Vocal Album; Shawn Everett for Best Engineered Album, Non-Classical (for Alabama Shakes‘ Sound & Color); Third Man Records for Best Boxed or Special Limited Edition Package, Maria Schneider for Best Arrangement, Instruments and Vocals (for David Bowie‘s “Sue [Or In A Season of Crime]),” and Louis CK for Best Comedy Album. More: Mavis Staples for Best American Roots Performance, Jason Isbell for Best American Roots Song and Best Americana Album, Buddy Guy for Best Blues Album; Glen Campbell for Best Soundtrack Visual Media; Amy Winehouse documentary Amy for Best Music Film; Chris Stapleton for Best Country Solo Performance; Skrillex & Diplo for Best Dance Recording (w/ Justin Bieber) and Best Dance/Electronic Album; The Weeknd for Best R&B Performance and Urban Contemporary Album; D’Angelo for Best R&B Song and Best R&B Album; and more. Still more: Ghost’s Cirice wins Best Metal Performance; Alabama Shakes‘ “Don’t Wanna Fight” for Best Rock Song and Best Alternative Album for Sound and Color; Muse‘s Drones for Best Rock Album, and more. Kendrick Lamar’s gonna do something very controversial. And that’s what art is about, right? It’s not about whether you agree or disagree. It’s about it stimulating conversation and provoking people to have conversations about society. And if that’s what you want your art to do as an artist, if that’s the lane you choose, you’re accomplishing something if people talk about what you’re doing. So, it’s gonna be amazing.